1.Prepare Shallot-Mustard Chutney: Heat large skillet over medium-high heat until hot. Add shallots, apple and oil; cook 5 minutes, stirring occasionally. Stir in apple cider and mustard powder; reduce heat to medium. Cook 10 to 12 minutes or until browned and tender, stirring occasionally; stir in remaining ingredients. 2.Meanwhile, prepare Spiced Beet Salad: Position oven rack 6 to 8 inches from source of heat; preheat broiler. With largest holes of box grater, grate carrots and beet. You should have about 1-1/2 cups carrots and 1-1/2 cups beet. In medium bowl, whisk together oil, honey, lemon juice, salt, pepper, cinnamon and clove. Add onion, carrots and beet; toss until well combined. Makes about 3 cups. 3.Prepare Pork Chops: Coat pork chops with oil; sprinkle with salt and pepper. Place pork chops on broiler pan; broil 7 to 9 minutes or until internal temperature reaches 145°F, turning once halfway through cooking. 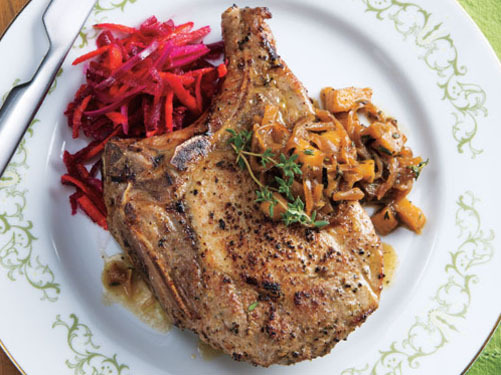 Serve pork chops topped with chutney along with beet salad; garnish with thyme sprigs, if desired. Pork loin is a lean cut of protein. So look for “loin” in your cut of meat when you’re shopping! Spiced Beet Salad can be prepared, covered and refrigerated up to 1 day. Let stand at room temperature 20 minutes before serving. Shallot-Mustard Chutney can be prepared, covered and refrigerated up to 1 day; reheat before serving.